When things get retired after being used for a specific purpose, people have just nothing to do with them but to throw them on trash piles, in dumpsters or on discarded material heaps! The owners of shipping companies also treat the pallets in the same when they just get off from shipping duties! It is the globally accepted truth and the reality that pallets are the wooden skids that do not die too early due to their hardwood compositions so that can be reused over and over again! So people don’t think so and just consider them useless, and if they believe them worthy then it is only for burning purposes! So to make all of you a big fan of strong recycling-potential of pallets, we are having here these 30+ pallet ideas that just encircle all unique and ingenious ways of creative recycling of pallets to build pallet furniture projects! Rustic nature of pallets can be pretty to use for outdoor furniture crafts, and you can start organizing your outdoors by building excellent pallet sofa sets for your patio, custom sitting plans for your green space and also multiple different kinds of outdoor chairs and benches like given Adirondack chairs and a stocky patio bench! There are other trendy ways to spruce up your green space with pallets, and people mostly make this happen by building vertical pallet garden planters, wall hanging herb gardens with pallets and also custom self-standing box styled planters, this given three-tiered pallet planter is also something viral and unusual in this respect! 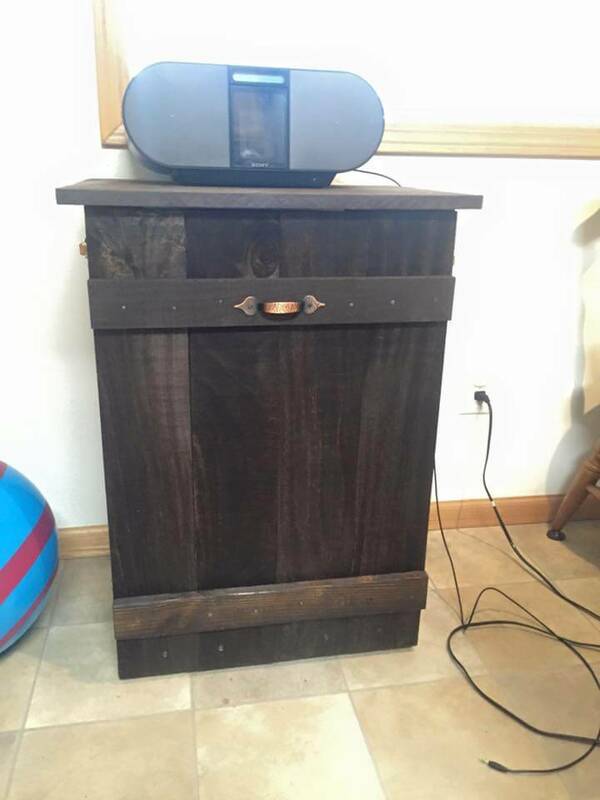 For your interior decors, there is a pallet-made console that will grab all your attention, from accent to functional, the pallet console tables can be hired for anything, and some majorly made consoles out of pallets are entryway consoles, decorative hallway consoles, media consoles and foyer consoles! 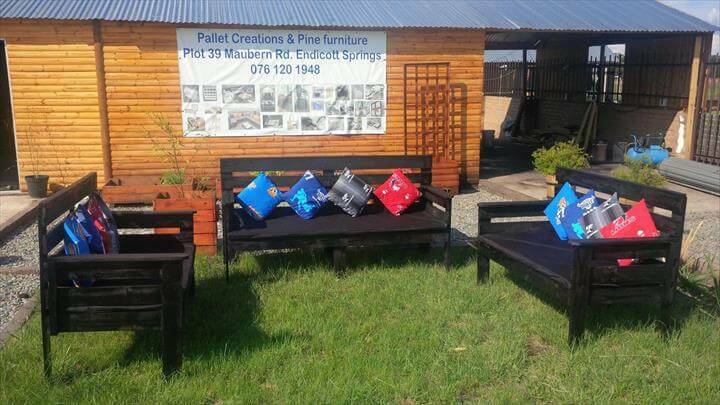 Some easy pallet ideas have been shown below to build your Pallet Furniture and other DIY Projects! 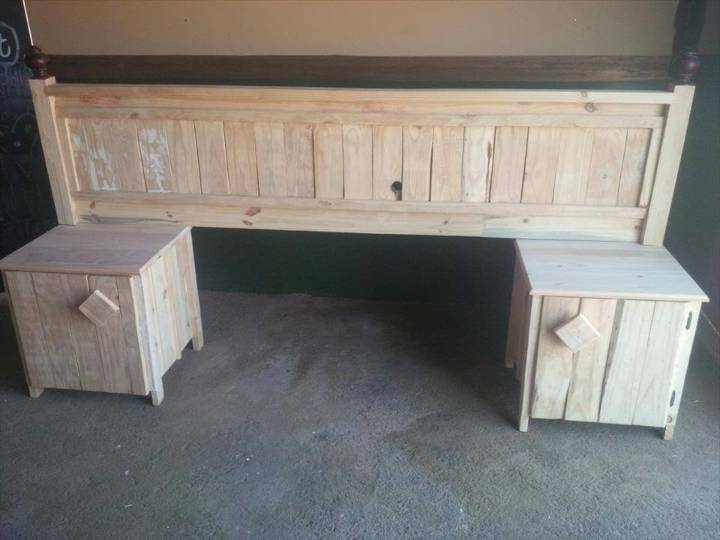 In this modern age, the computer and laptops are to see in everybody’s home, so to operate them conveniently, pallet wood is just offering here these free wooden desks which are a need of every office worker and also a student! Check out here a new DIY plan to grow you rare and hard-to-find herbs, get a pallet board and make it hold a lot of baskets, pots or tin cans and just-just start growing your favorite herbs in it! 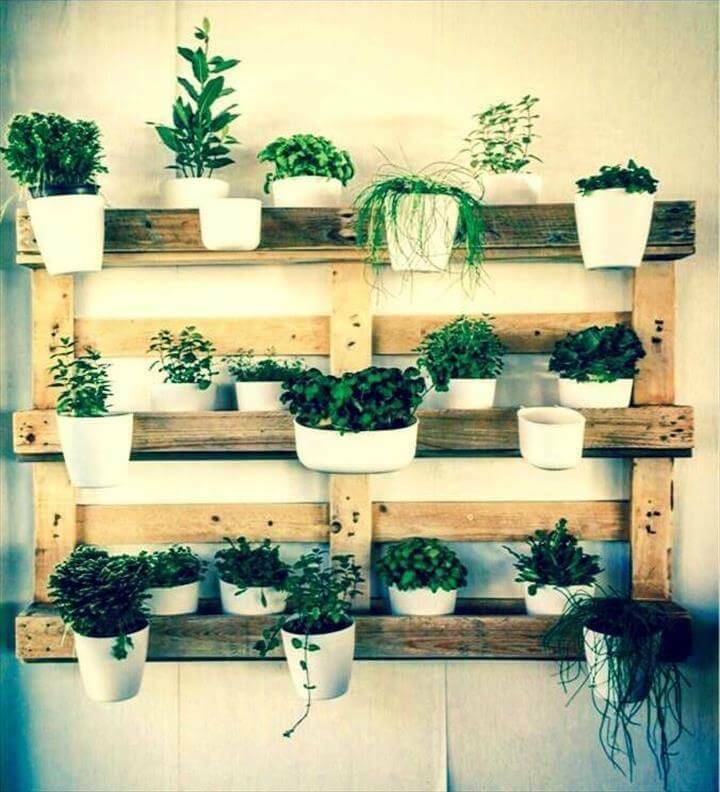 The amazing thing is that you can shift this pallet-made herb or flower garden to any wall area for an immediate nature vibe! 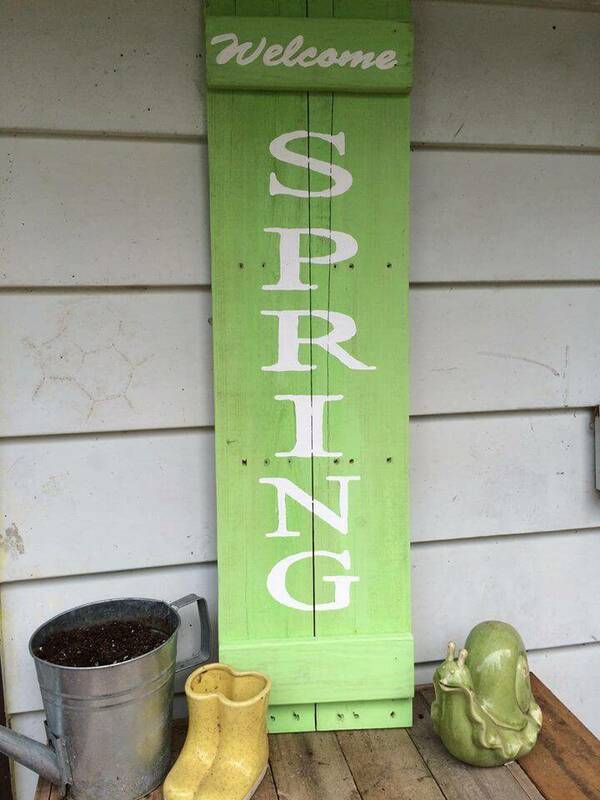 Pallet wood is just ideal also to build the custom symbols, signs and shapes which can be mounted on your interior wall areas as custom wall art pieces, learn a lot from this given green painted welcome spring sign! Willing to activate an attractive mode of your garden? Just bring this three-tiered planter there! A stand and three wooden baskets have been made with pallets, the baskets have been fixed in a row over the wooden stand using hardware! 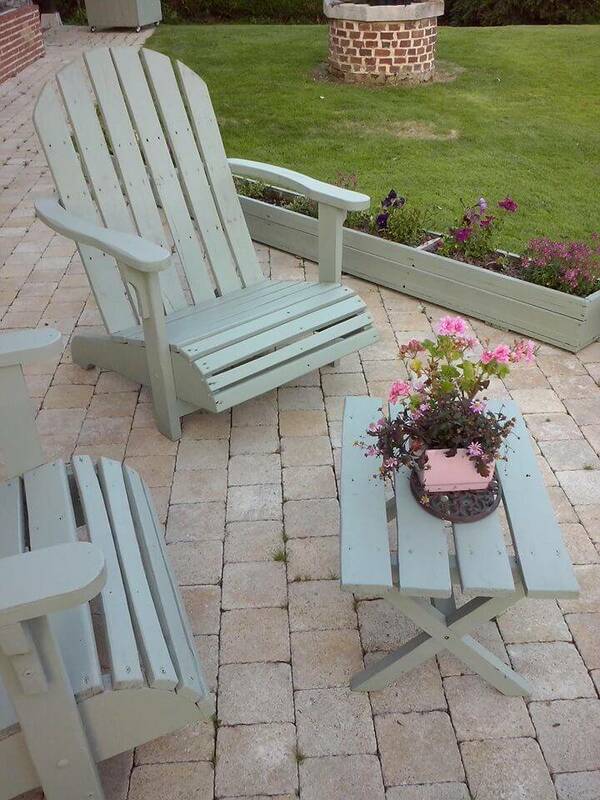 Enjoy the adorable view of your garden and outdoor by sitting on these traditional styled pallet chairs, the perfect Adirondack wooden chairs! The design is kingly and has especially been made to capture outdoor scenes! 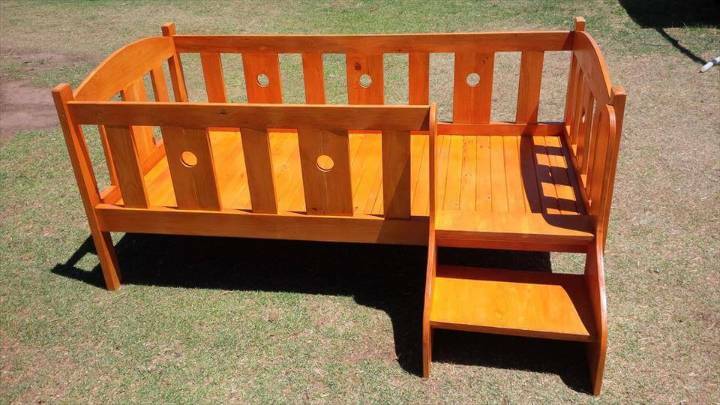 Get your hands onto this free wooden bench, having all sturdy dimensions handcrafted with pallets! 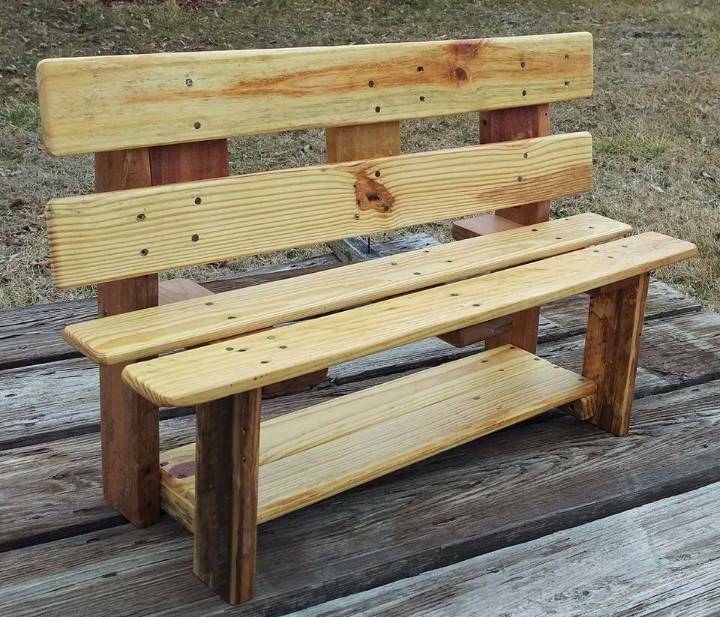 This rugged bench design is something you will be highly needed when enjoying BBQ feasting at outdoor with a group of friends! Take advantage of feasible pallet shapes and build the item of furniture you need in your home in custom dimensions, this console is a better sample here and is all unique due to X-style sides frames! Another cool furniture craft to build with pallets! Pallet wood has just broadened up the concept of outdoor entertainments as people are just getting them for free for custom PALLET outdoor furniture and fun-making setups! The self-installed outdoor deck that also comes with wood flooring and Adirondack style patio sitting set are remarkable pallet project to discuss in this respect! Go for wood paneling of interior wall areas using free pallets and bring them a charming rustic wooden touch, a brilliant texture and lot of protection for free, the given headboard wall and living room media wall may serve as leading inspirations in this regard! Install custom legs like metal hairpin ones, to a bottom of pallet board and get a perfect study desk, a sample has been given below that also comes with a glass top! One can even build the whole living room table set with pallets like a DIY coffee table, an end table, a behind sofa table and also a side table, take a little visit see the practical suggestions given below! 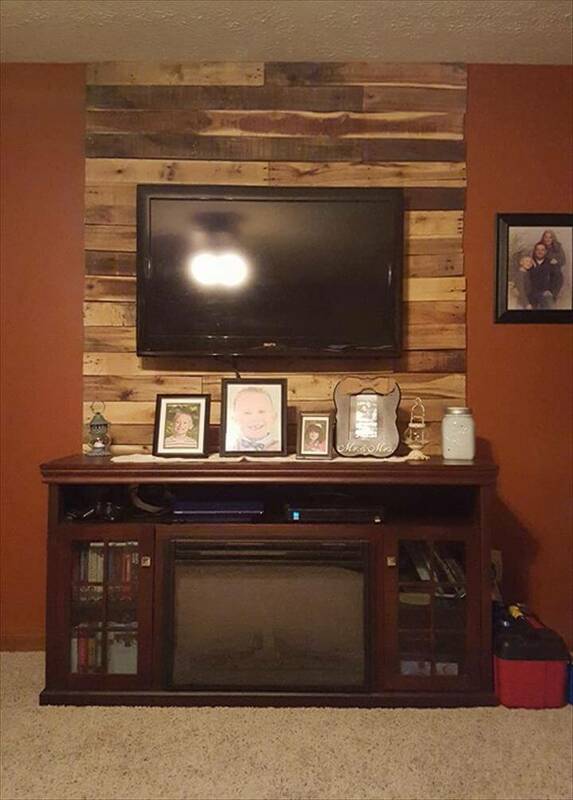 Need to provide a rustic wooden touch to your modern living or media room? Build this wooden media wall using few dismantled boards of pallets; this wooden wall also guides you to do some wall paneling projects with pallets! 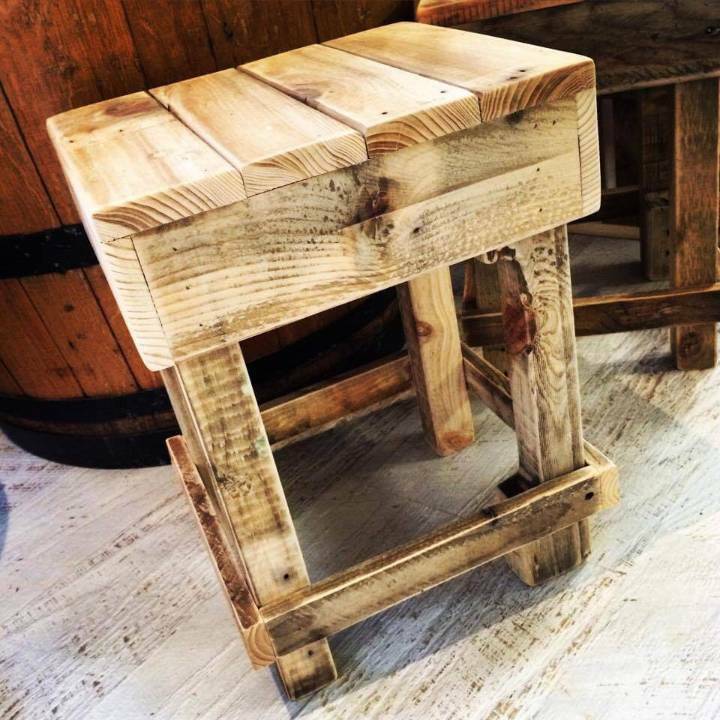 Time to judge the fantastic recycling potential of pallets, this charming end table have all been made of discarded remains of pallets! Well, sanding is all responsible for its glowing wooden appeal! Here is another big secret is going to finally reveal, you can even install custom outhouses, tree houses, decks and outdoor cabins with pallets! Here is how you can start any of these projects by introducing the floor and side walls first! Need to make an eye-contact to a never-ending blue umbrella and those of mountain peaks? 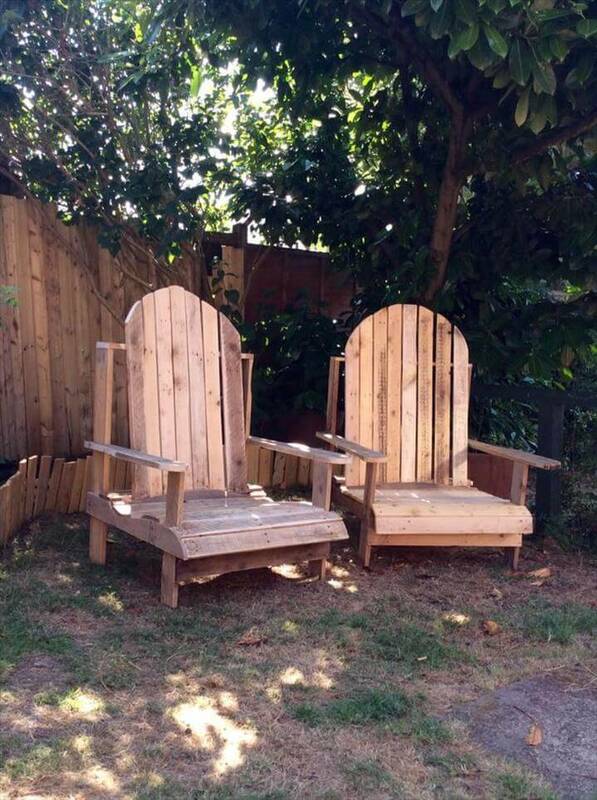 Just sit in these Adirondack chairs which give you the right-tilted sitting positions to do, it is free and easy to build this kind of chairs with pallets so why not get an Adirondack patio sitting set as given! 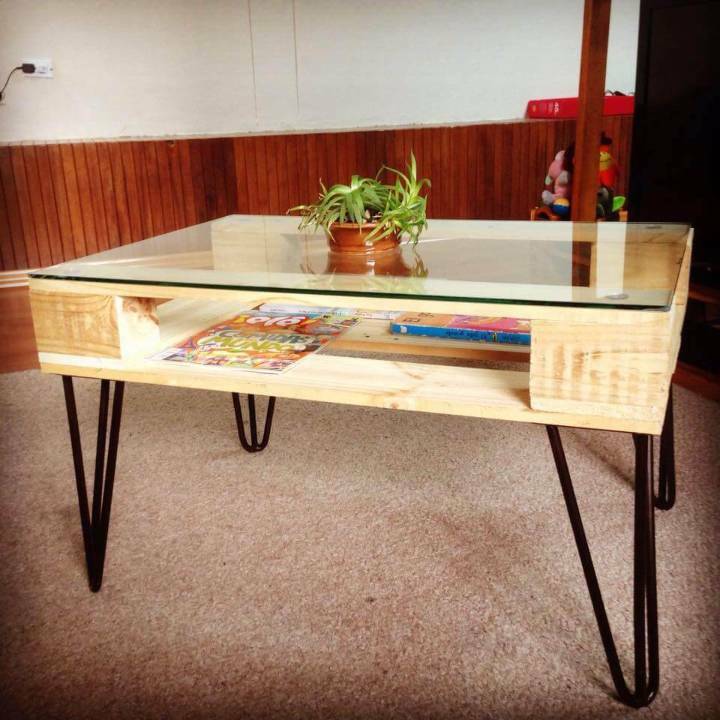 Here bottom of one pallet board has been raised on three post metal hairpin legs, made of an old metal scrap of home, while the top has been finished with glass top, this gives you the everlasting and functional design of table for multi-tasking in a house! 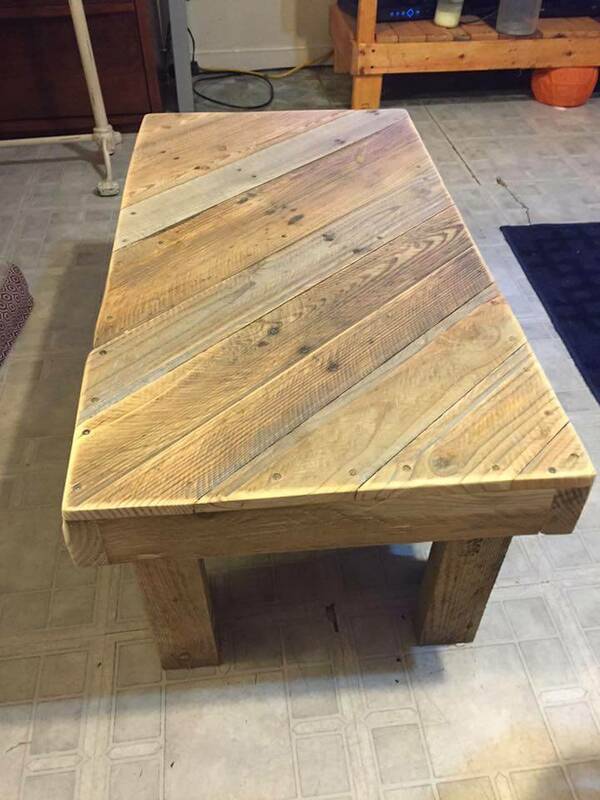 Pallet Coffee Table: Built in Diagonal Stripe Pattern! If you are searching the internet for some different pallet table inspirations, then this table design is what here that will grab your attention! A perfect wooden coffee table designed with the diagonal filling of pallet slats! Let the pallets handle your indoor and outdoor sitting space issues, rebuild the pallets into all kinds of benches you need to use on the patio, a mudroom, and in your garden and also stack them for some instant and quick sofa frames, the balcony sectional sofa set is a mind-blowing example here! One can even play with those already modified shapes of pallets creatively, join the bottoms of 2 pallet boards of same dimensions to get a storage-friendly coffee table, raise one pallet on custom legs for beautiful tables and desks designs and also plan the whole pallet boards to install vertical garden planters! 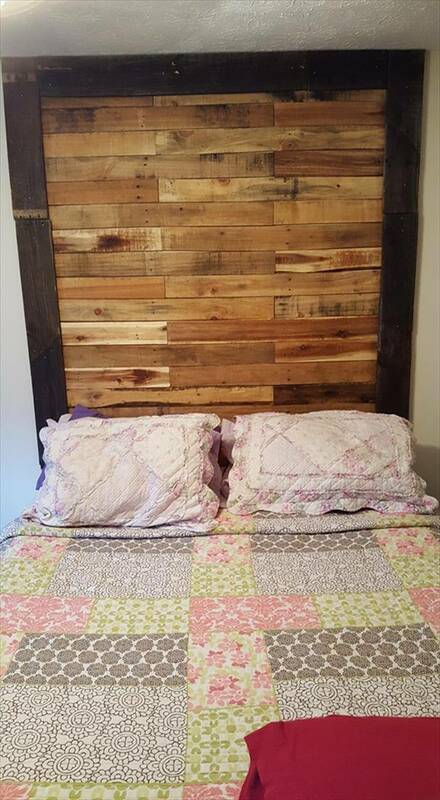 Pallet scrap may also utilize a lot, build custom wall sigs with pallet wood remains like given map and flag wall art piece and also integrate the pallet slats to make anything you need, the given headboard and two nightstand set is an exciting example here! 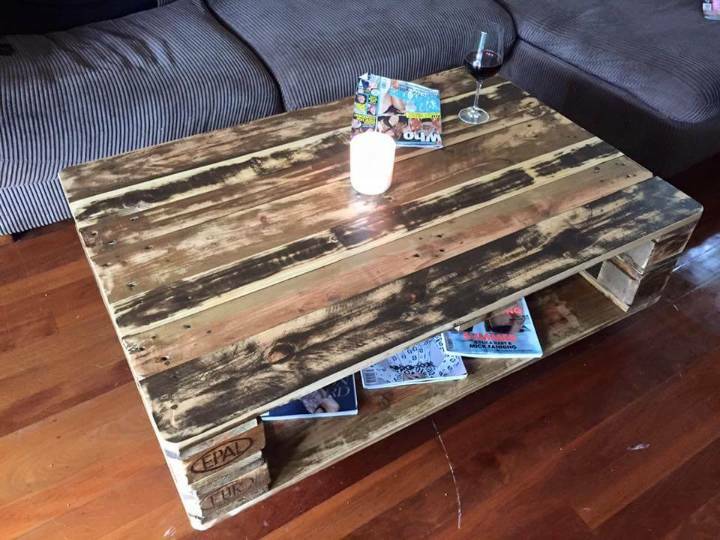 Get fantastic ways to reuse the two unmodified pallet boards; they can merely be regained into a chic coffee table if you just join their bottom correctly, the practical example of this concept is shown here in shape of this coffee table which also provides inside storage space! Get your rest of office works done it home, built a small room in your home for spare time working, need a computer desk for it? 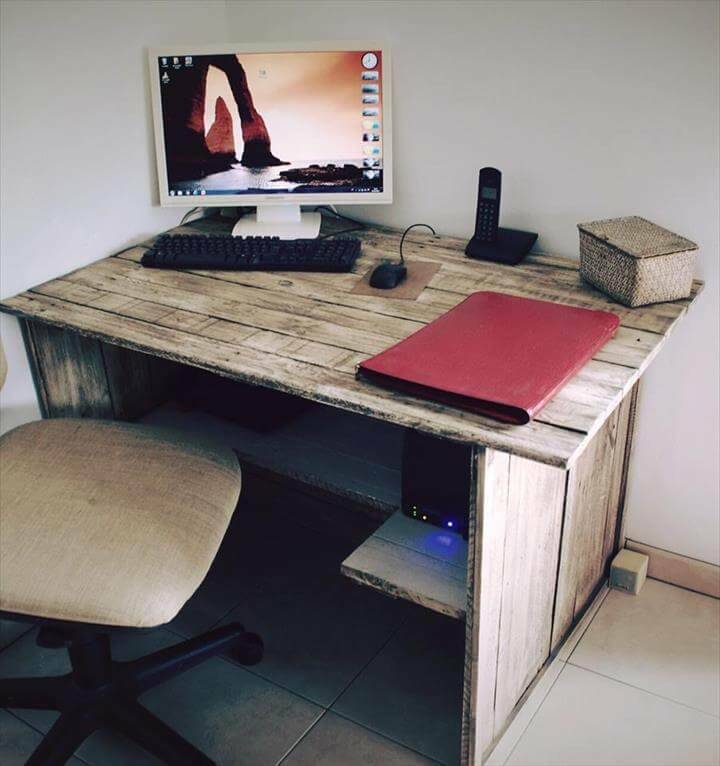 Just make it with pallets in dimensions that were precisely suiting your space, you can borrow the design of given rustic pallet desk here! 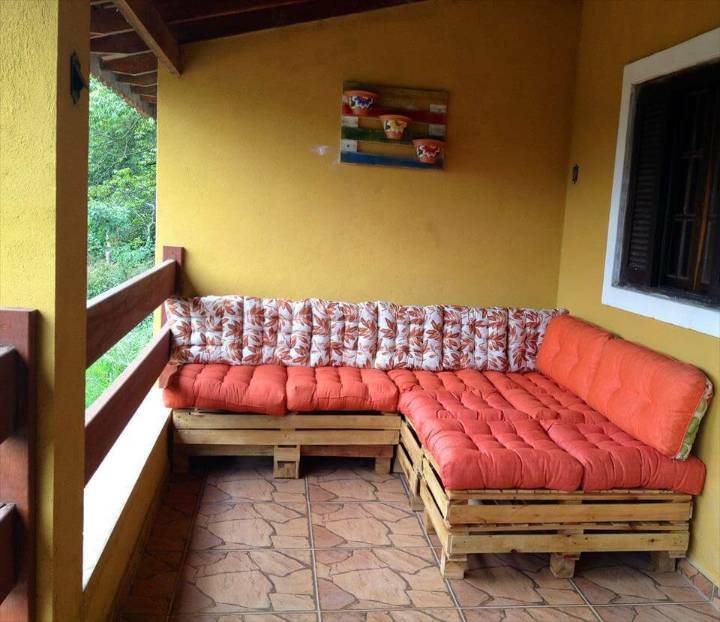 Setup your balcony or terrace space for spare time sitting, this custom built pallet sofa may be the items you are willing to gain to organize your higher level patios for sitting! 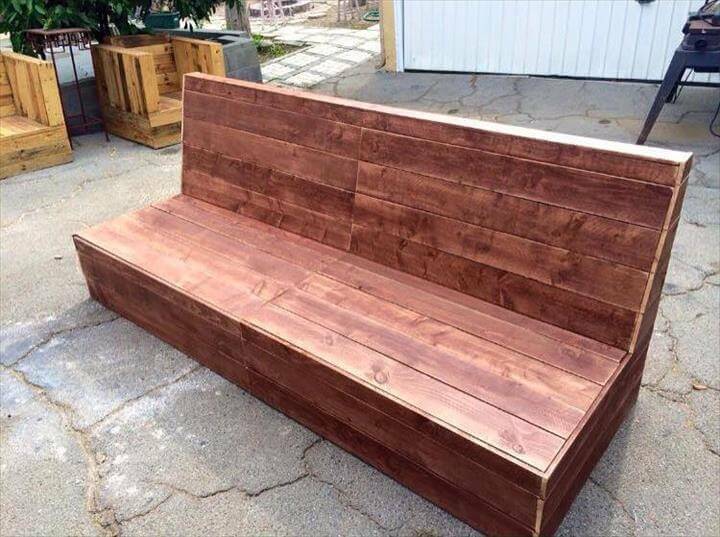 So get this sofa for free by getting some pallets! 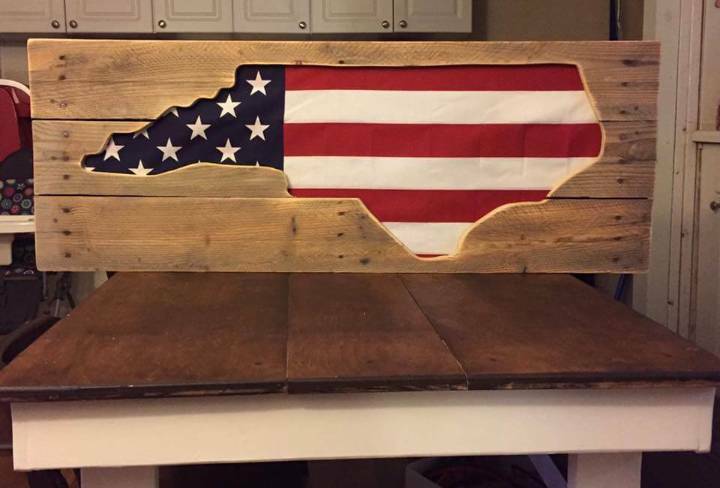 Build patriotic wall art pieces with pallets, the given pallet map and flag art pieces is the genuine way to go in this case! Mount on visually pleasing wall area to speak volumes for your love having for your country! Not only stable and long-lasting beds, one can even build the components of bed with pallets like nightstands, footboard and a headboard! Here you can see a custom piece of a pallet-made headboard and two nightstands having square shape wooden door pulls! 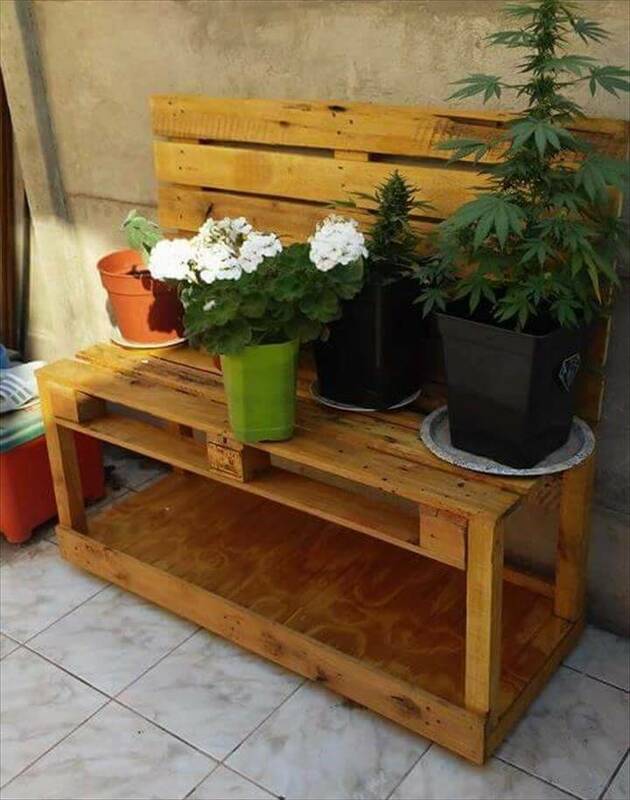 Recycle the pallets to get your outdoor better performing ever, clone this given bench design if you need to gain more sitting space at your outdoor! You can even fence your green area with pallets and can also reuse them for custom garden and patio sitting sets! Having a stock of pallets? Why not recycle them for super garden crafts and decors for a charming visual of your green space? 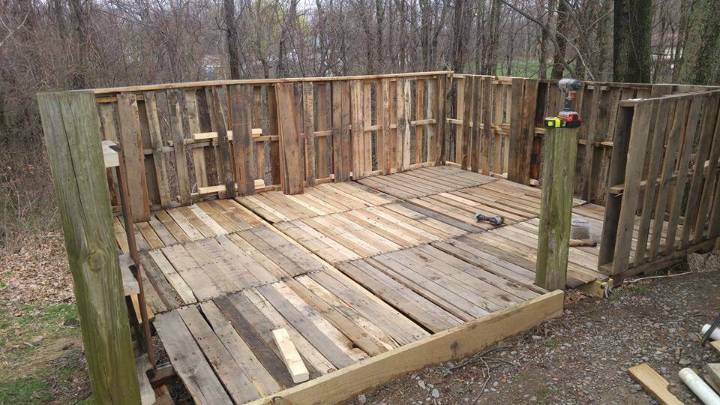 Time to be over smart as pallets have traditional crafts for the patio, garden, and backyard renovations! The first thing you can get in this case is a potting bench which provides surfaces to display your garden pots, some shelves to store your garden stuff and also working surfaces to do some garden-related repairs and works! Also, build the planters out of pallets and amazing garden sculptures with the pallet for a visual boost to green space, the given pallet-made safari jeep would make a brilliant choice in this case! Modify the pallets and get kitchen spice racks, beverage bottle racks, and custom coat racks out of them, also grab them to build all kinds of mini and big tables! 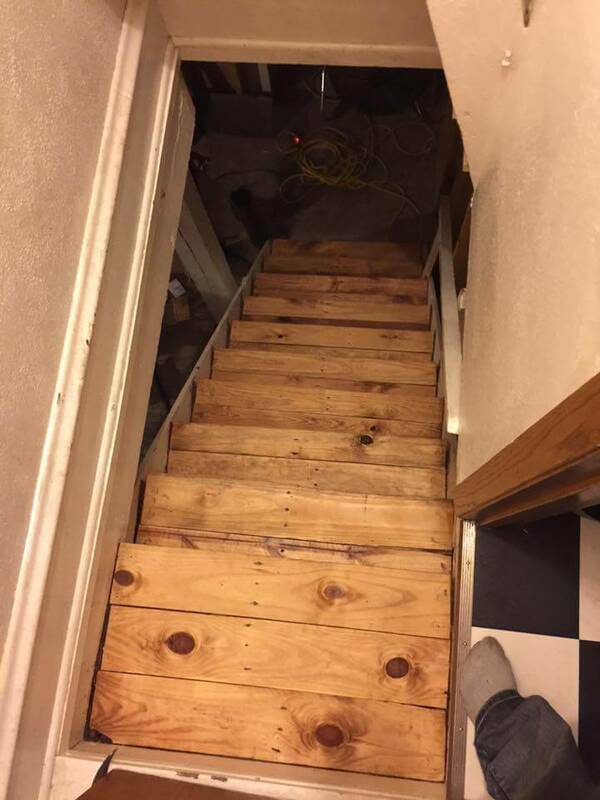 Making the pallet stairs, do easy wall paneling projects with pallets or to install the interior wood flooring are some of the grand plans to do with an improved look and functional behavior of your home! Convert the pallets into tangible boxes and plan those boxes as planters to spread greenery all around in or out of your home! 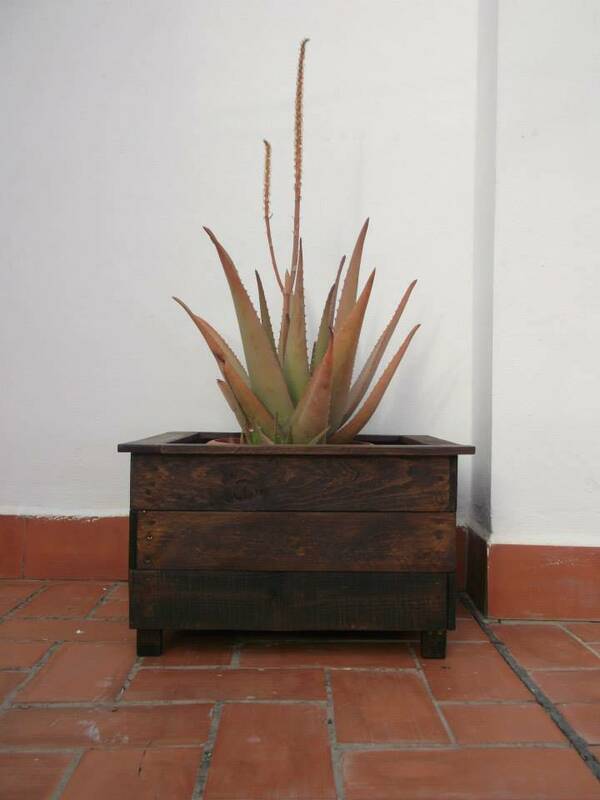 This custom made wooden planter is also composted of pallets! 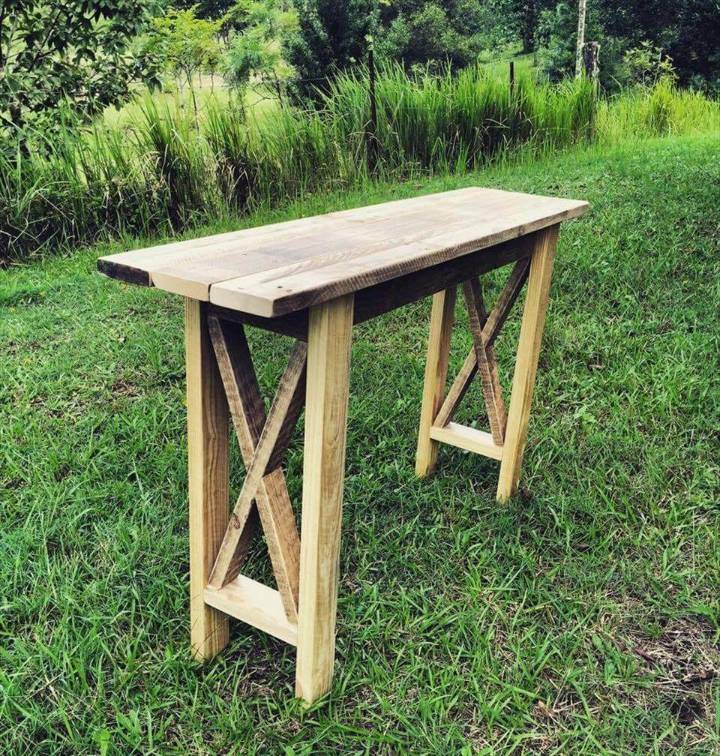 While renovating our garden space, we need to do a lot of repairs, and this pallet potting bench design may provide you a better working surface! It can also be planned as a custom pot organizer to showcase a variety of your flower or herb pots! 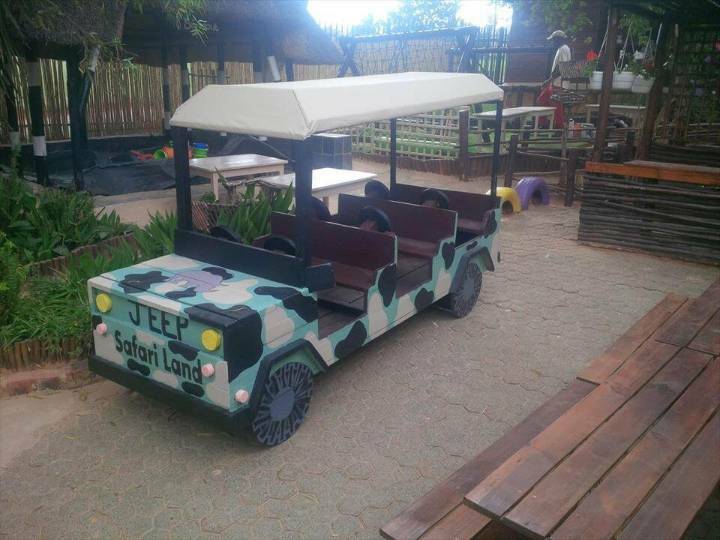 Build this crazy safari jeep with pallets which would make an ever delightful gift for your kids; this is something ever unique and gift-worthy to build with pallets! 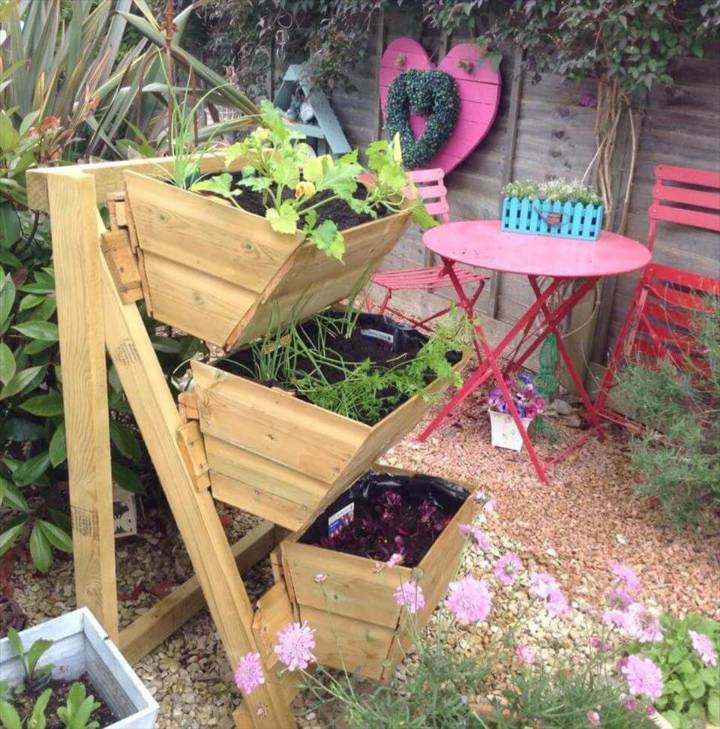 You can also create the faux wooden train engines and other garden sculptures with pallets just to raise the fun of your green space! 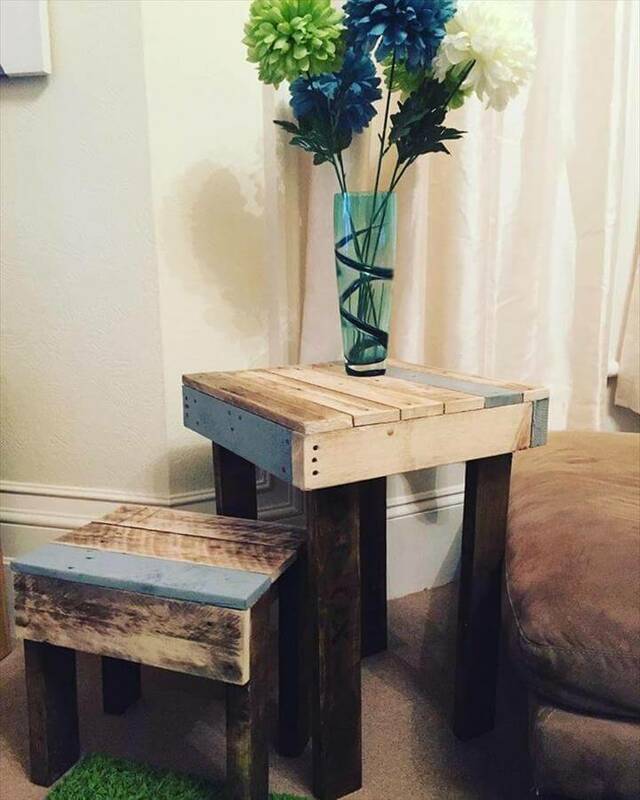 Mini tables are always welcomed insides of chairs and sofas so why not get them for free by rebuilding some retired pallet boards; a pair has been given below to get you inspired! 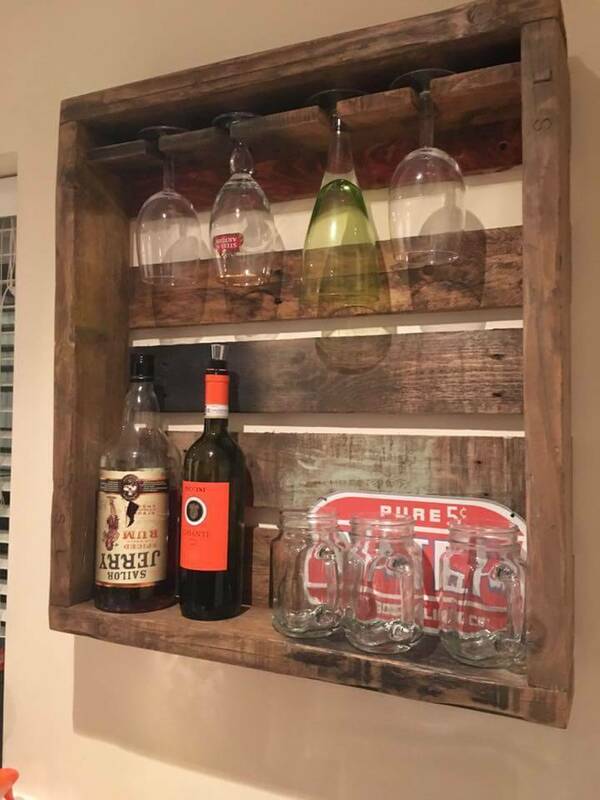 Pallet wood also has too much to give to beverage lovers; one can build the bar tables, beverage glass and bottle racks with pallets and even the custom bar stools and chairs! Check out here the rustic sample of beverage bottle rack to pull some more tricks to recycle the pallets for your unique purpose! Improve both of your interior and exterior entryways and stairways with pallets, build ramps and customs stair steps with pallets quite quickly, given pallet-made stair steps may be what you are looking for inspiration! We are all having interest in different things; you may be linked to any profession or field, the pallet crafts are just having too much to give to every single having a unique taste! If you are a pet fan, you can build aviaries, rabbit cages, chicken coops and also the dog and cat houses! By getting helped by pallets, you may even install perfect feeders for your pet like the given dog feeder! 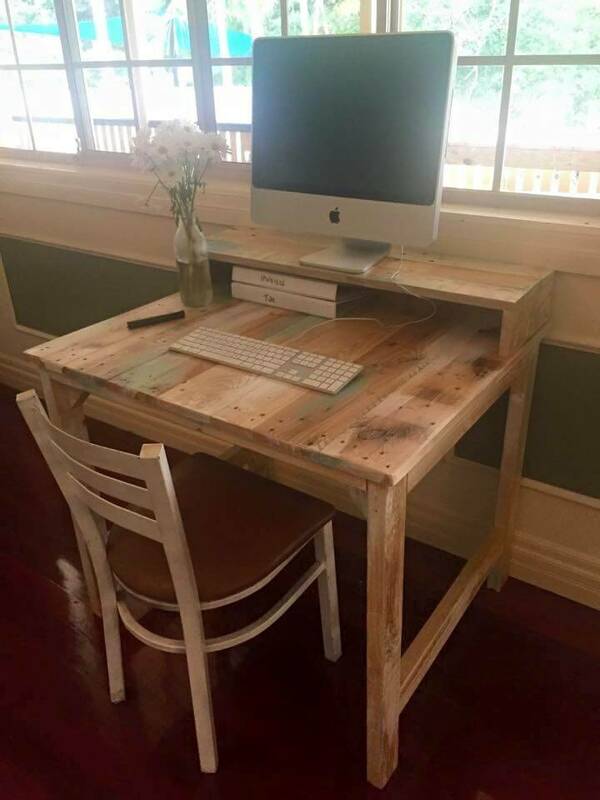 If you are an office employee and also like to part-time in the home, so you built custom computer desks with pallets, a new instance has been shown below! The parents can take advantage of pallets to construct outstanding cribs and custom baby beds with pallets! The garden lovers can regain pallets into the amazing wall hanging and self-standing vertical planters and also into pot organizers! Convert the pallets into welcoming designs of wall art pieces and even create personal wall symbols with them depicting your taste of decors, given a welcome spring sign is a neat item here in this case! 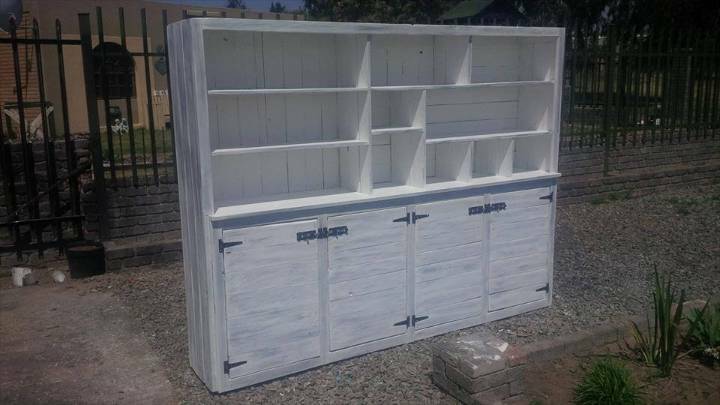 Get durable kitchen hutches out of pallets to store well the kitchen clutter or and don’t forget to build the headboard walls which are not in trends! 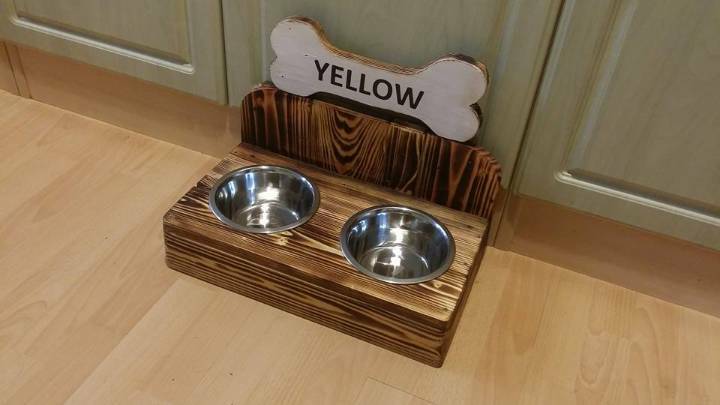 Let your dog eat more without wasting even a bit of his food, just grab these pallet bowls, dignified with a dog-bone tag at the top! Build an L-shape wooden stand and fix the bowls just in and done! To build a headboard with pallets is something that is becoming an old fashion to recycle the pallets, now people are just building headboard walls which also give the user a bundle of more ideas to decorate his bedroom! Check the sample here with black accent borders! To store volumes of kitchen paraphernalia, the DIY is presenting here this self-made, no-cost a super functional design of kitchen hutch having XL dimensions! It has many built-in storage compartments, shelving levels and also the sub-cabinets which would just rock to digest large amounts of kitchen clutter also! Install this custom crib design for your baby who has recently started crawling! This crib design comes with a unique functional twist; it has a folding entrance which serves as stair steps while being unfolded! Just fold the stair steps again for an entirely fenced crib! Amazing! Refine the pallets and restructure them for some mini table consoles like the given black dominant one, use it as a radio table, as an accent table and also as a side table or nightstand! It’s lower also opens for some storage space which is another great bonus! Everyone here likes the group’s conversations, they become more enjoyable if you are being done at outdoor or in your garden, so this free black painted sofa set is all waiting for a get together of your friends or family members!